Hot Knife Tool with 3" Blade - Dino Rentos Studios, INC. The most popular, 4-1/2-inch-capacity Hot Knife foam-cutting tool in the world! We've packed a whopping 105 watts of power right in the handle, making this the most compact, strongest tool in its class. We've added even more value to the Hot Knife with the development of both the GJA3G and GJA4G groove base sleds. This broadens the range to incorporate the use of 26 additional Groove Jet blade options. This is limited-time-use tool. To avoid overheating and damaging the tool, depress the trigger for 15 seconds, then release the trigger for 15 seconds. Continue this cycle for a maximum of 5 minutes. Then let the tool rest for 2-1/2 minutes. 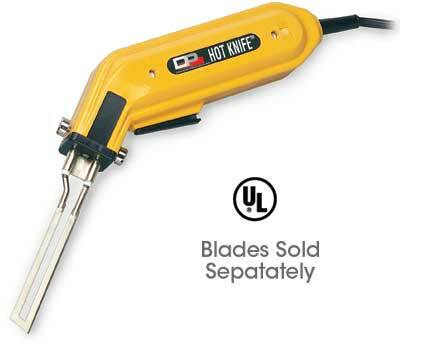 Using the tool longer than 5 minutes at a time will cause heat damage and is not covered by the warranty. Do not use a screwdriver to tighten the blade screws. Finger-tighten only!